The Plott hound became the state dog by legislative decree on 12 Aug. 1989. It is the only dog breed that is officially recognized as having originated in North Carolina and one of only four breeds that began in the United States. Ancestors of the modern Plott hound were among the dogs brought to America by Johannes Plott, a German gamekeeper, when he immigrated to Cabarrus County in 1750. The Plott family and other Germans used these European cur dogs with traces of mastiff to protect their employers' shooting preserves from large predators such as bear, boar, and wolves. The Plotts continued to develop the breed through careful culling and rare but productive outcrossing to hound stock such as the black-and-tan coonhound. In 1800 Johannes's son John moved the family to a large tract in Haywood County near Waynesville, where an abundant population of bear and (after 1908) imported European boar kept the dogs in high demand, as they have remained. The Plott hound is a medium-to-large dog, averaging 50 to 60 pounds, of somewhat stockier build and with shorter ears than typical hound breeds. Its head tends to be more massive and its jaws more imposing, and, although it trails as well as the best of hounds, its voice tends to be less melodious. It is a powerful and tenacious fighter, held in high esteem wherever large game is hunted with dogs, such as in the mountains of North Carolina and Tennessee. Most specimens of Plott hounds are of a dark brindle color, but black and buckskin color phases are not uncommon. References: Curtis Wooten, "Johannes Plott's Famous Hunting Dogs," in Jim Dean and Lawrence S. Earley, eds., Wildlife in North Carolina (1987). Holcombe, Randall. "Popualr Plotts: This exhibit from the Mountain Heritage Center is no dog-and-pony show." Western : the magazine of Western Carolina University 15. No. 2. Summer 2011. p. 8. http://digital.ncdcr.gov/u?/p249901coll22,412951 (accessed October 25, 2012). Mw2bonn. "Plott Hound Caught Playing with Shoes." Photograp. July 23, 2008. http://commons.wikimedia.org/wiki/File:Plott_Hound_caught_playing_with_shoes.jpg (accessed December 12, 2014). Used under GNU Free Documentation license. "Unidentified man with Plott Hounds on a bear hunt in Lake Waccamaw, NC, circa early 1950s." Image courtesy of UNC Libraries. 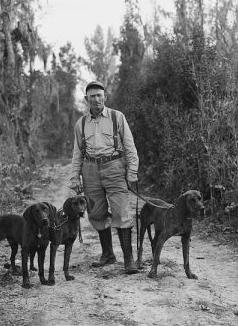 Available from http://www.lib.unc.edu/blogs/morton/index.php/2008/02/of-fine-nose-and-beautiful-voice/unidentified-man-with-plott-hounds-on-a-bear-hunt-in-lake-waccamaw-nc-circa-early-1950s/ (accessed August 22, 2012).